Share your photos on Instagram with the hashtags #croquetdress and #oliverands. Short-sleeved, dropped-waist dress in two versions. View A features a nautically inspired collar detail. 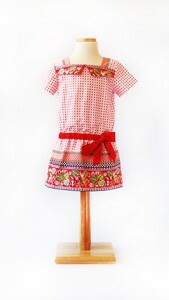 View B has gentle gathers at the front and a simple yoke detail which is perfect for embellishment. 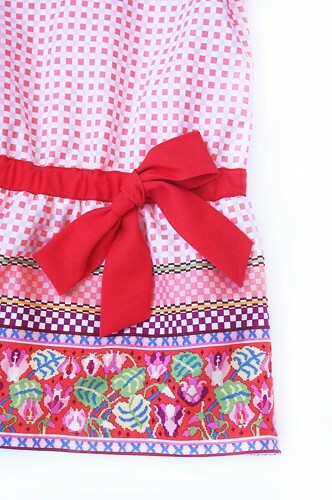 The elasticized waist in both views is comfortable and features a cute bow detail. 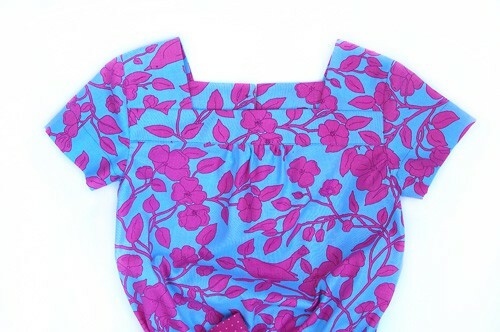 After successfully sewing this pattern, you will have developed the following skills: flat-set sleeves and gathering. 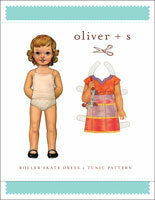 Light- to medium-weight woven fabrics like quilting cotton, broadcloth, shirting, poplin, chambray, and linen. Coordinating thread, lightweight fusible interfacing, one 3/8" or 1/2" button, 1 yard of 3/4"-wide elastic, 1/2 yard of 1 1/2"-wide ribbon for bow (optional). Chest 21 3/4" 22 3/4" 23 1/2" 24 1/2" 25 1/2" 26 1/2"
Length* 17 1/4" 18 1/4" 19 1/2" 20 1/2" 21 3/4" 23"
Sleeve** 8 1/4" 8 1/2" 8 3/4" 9" 9 1/4" 9 1/2"
Length* 24 3/4" 26 1/2" 28 1/4" 30" 32" 34"
Sleeve** 9 3/4" 10" 10 1/4" 10 1/2" 10 3/4" 11"
I sewed the croquet dress for my granddaughter Samantha, and she has worn it quite a bit. 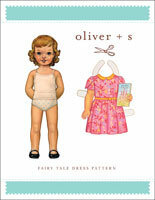 It is the third Oliver and S pattern I used, and I really appreciate the sophisticated styling plus the very clear directions. In the first printing of the paper version of this pattern, the instructions contained a minor error. On page 3, in step 4 under the section "Prepare the Front (View B)," the second sentence should read, "Pin and stitch the opposite (unfolded) long edge...." This error has been corrected in the digital version of the pattern that is currently available. 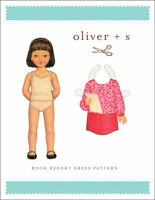 Discussion on the digital croquet dress sewing pattern from the Oliver + S Discussion Forums. Find and share more photos on Instagram using the hashtags #croquetdress and #oliverands.